Pushing to wheel himself from sea level to the top of Mauna Kea, Pennsylvanian Sean O'Neill was on Saddle Road passing through rain forest yesterday afternoon, about a third of the 43-mile distance to his goal. HILO » Pennsylvanian Sean O'Neill hopes to reach the summit area of Mauna Kea today, rolling his wheelchair 43 miles from the Hilo shoreline to the road among summit observatories. O'Neill is competing against rain, cold, lack of oxygen and grades as steep as 15 percent over an unpaved 5-mile stretch of the summit road. Talking with the metal sculptor, 40, from East Lansdowne, near Philadelphia, you'd almost think such considerations were irrelevant. "It's like an experiment," he said. "I'm going to give this hill a shot." Mauna Kea is 13,796 feet high. Some "hill." O'Neill doesn't even think of himself as an athlete. 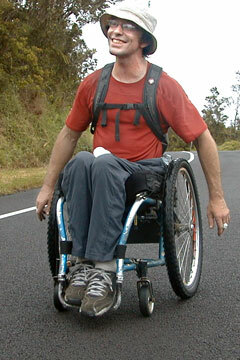 He began wheelchair mountain climbing in New Hampshire just a year ago. "I'm a tourist," he said repeatedly. But he practiced for Mauna Kea by wheeling through the Rocky Mountains of Colorado before arriving here Monday. "He's so fit. That makes him an exceptional 'tourist,'" commented his friend, Big Island resident Raul Perena. Questioned about the climb, O'Neill frequently answered, "I don't know." When would he start up? "I don't know." He eventually started at 8 a.m. yesterday. How much food and water would he need? "I have no clue." Perena returned to town yesterday to get Gatorade and water. It's not as if O'Neill had no interest in these things. He noted Thursday that he was "getting sorted." As O'Neill rolled away following a rest stop on Saddle Road yesterday, Perena held back to explain O'Neill's thinking. Like O'Neill's brother Timmy, Perena is a rock climber. And rock climbers, including O'Neill, think pretty much the same, Perena said. "I don't like to commit to anything," he said. "You follow a certain level of intuition." O'Neill's intuition seemed to be working. On Thursday the weather forecast for the weekend was heavy showers and possible snow on Mauna Kea. By yesterday the forecast mellowed to moderate showers and no snow. But O'Neill hadn't checked the weather report and didn't know that. "I just got bored waiting," he said. This intuitional approach to Mauna Kea was making authorities uncomfortable. The climb will take at least 24 hours, so some of it will be at night. Mauna Kea Ranger Kenyan Beals questioned whether O'Neill's effort is "logical." Beals' boss, Bill Stormont, said, "I wish the guy well. I don't think he's going to make it to Hale Pohaku." That's where pavement ends and steep, gravel road starts. Rangers discourage people from being above Hale Pohaku after dark, although it's not banned outright. "It's pretty hazardous to be doing this," said Ron Koehler, in charge of keeping the road open. Intuition hasn't always worked for O'Neill. He thought about jumping from a Memphis, Tenn., bridge into the Mississippi River for more than a year before doing it 15 years ago. He landed wrong and was paralyzed from his hips down. At least this time he has Perena and volunteer Dan Beardsley keeping an eye on him.